Throughout history, humans have ascribed specific meanings to flowers. Floriography, the art of speaking with flowers is believed to have originated in Persia where illiterate women of the Ottoman seraglios used flowers to communicate, as written language was forbidden. The practice of speaking with flowers gained popularity in Europe during the Victorian era, when people selected the flowers within a bouquet as carefully as they would choose the words for a letter. In a similar way, my paintings are rich in symbolic meaning. 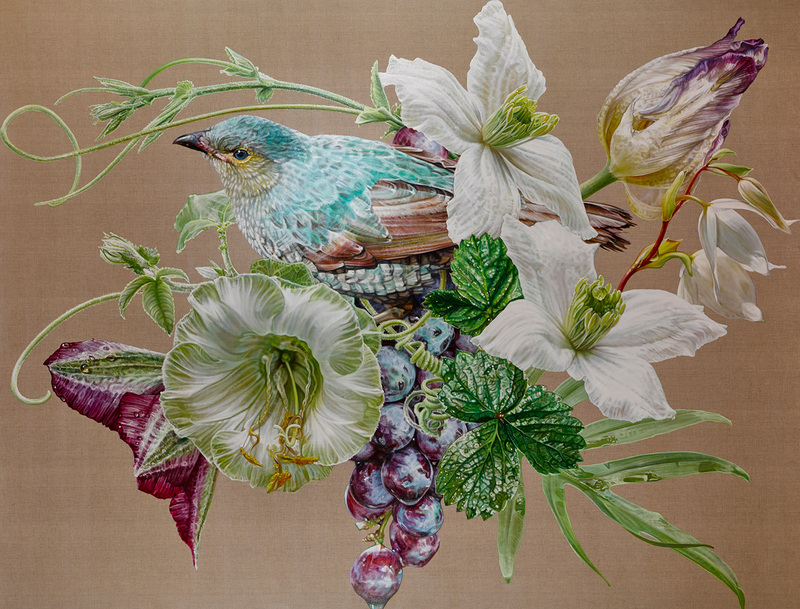 The mix of birds, insects, flowers and fruits create a tapestry of symbols. Sometimes I reference their shamanic or totemic meanings, or the traditional meanings ascribed to their colours or behaviours, or the significance to me, of their environment and beauty. At other times I reference their scientific names in deference to the rich history of botanical art spanning many centuries. Jade Bird of Dreams and Tranquility evokes calm and serenity. It is a painting to soothe the soul: a green nest of interwoven images shaping a place of respite and intimacy. Green balances the heart and the emotions, creating equilibrium between the head and the heart. It is the colour of the heart chakra – the energy centre that powers love within, around, and beyond ourselves. The delicate hue of the female bowerbird evokes the qualities of jade – those of wisdom, balance and peace. The vibrational energy of jade is said to relieve anxiety. It is the gemstone of healing and stability. Jade lightens fear and is calm and clear. It heals the heart and the nervous system. In past millennia, the Chinese regarded jade as crystallised moonlight fallen down to earth from the heights of the holy mountains. White tulips send a message of forgiveness, and a promise of worthiness in love. Strawberry leaf calms the nerves and the stomach, promising a restful night’s sleep. It protects the eyes and soothes an aching body. Clematis evokes peaceful thoughts, and mental clarity. It focuses the mind and promises safety for travellers. Grapes promise abundance and charity. To dream of grapes foretells of a very long life. Grapes are linked with love, fertility and virility, and in ancient Greece it was traditional to give clusters to newlyweds. Convolvulus, commonly known as Morning Glory, is symbolic of love, marriage and eternal sleep.